Want to setup a dedicated listen area for your outdoors? 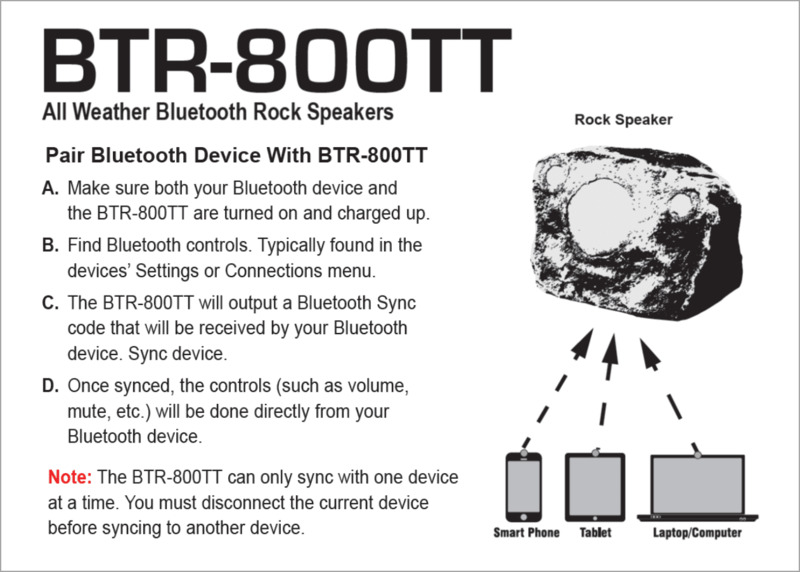 The BTR-800TT Wireless Bluetooth® Single Stereo Rock Speaker is an awesome addition to your outdoor space, with innovative design of dual tweeter, this single stereo speaker can produce stereo sound in one rock. Note; the BTR800TT features four inputs, right positive and negative and left positive and negative. The result is what we call a summed Mono Stereo Signal with a right and left tweeter and common woofer. You can only connect this single speaker to your Bluetooth® device. It's compatible with any Bluetooth®-enabled device, and it's available in canyon brown and slate so you can coordinate your garden, poolside or any other spot in your landscape. 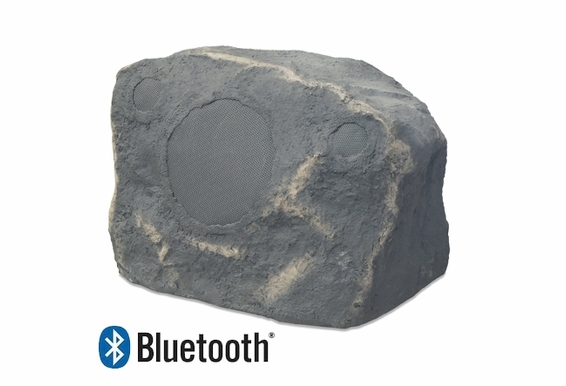 This realistic rock speaker might be the perfect addition to your outdoor space. A. Place Rock Speaker near 110 volt AC outlet so the Power Supply can be connected. This will provide electrical current needed for the Internal Amplifier & Bluetooth® Receiver. B. Make sure that the Power Supply Block will NOT be sitting in water. C. The speaker wire can be cut down for an exact fit but should NOT be extended beyond 30-feet. D. Turn power button on. Red LED indicator light will light up when power is on. 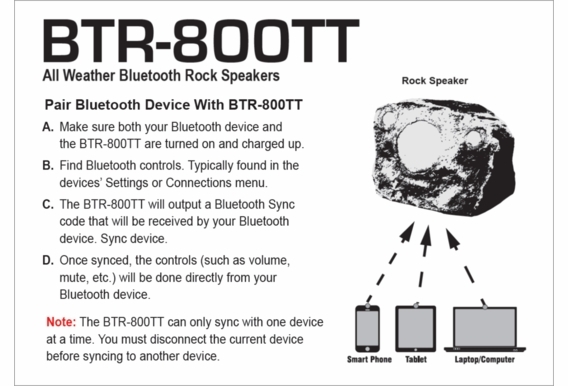 One of my rock speakers does not work and it is way under the 1 year warranty. How do I return and get a new set or a new speaker for the one that is not working ? Please let me know bc I love these speakers they are great when both are working. Please let me know what I need and what I do to get this taken care of asap. Thank you! 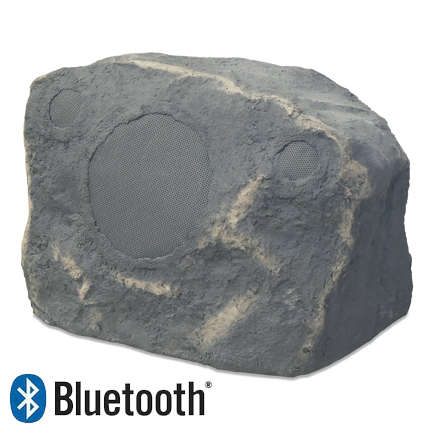 What would be louder - this unit or having the BTR805 Wireless 8" Bluetooth 2-Way Outdoor Rock Speakers? Also - how does charging work? Just got my speaker and love it. But I'm getting a slight hum in between songs and behind some quiter songs. Anyway to stop this interference? Just received this speaker and so far very pleased. My question, the on/off switch is inconviently Placed on the bottom of speaker, can it be left on? Can't imagine having to walk through landscaping and tilt the speaker each time I wanted to use. If I were to purchase 2 of these speakers and place them in different locations in my yard, could I link them both up to the same Bluetooth device at the same time to play music? I need multiple speakers but want them both wireless and not need speaker wire to connect them together. Can you buy two speakers and hook them up together? My question is similar to another persons. I have a Bluetooth transmitter hooked up to my AV reciever. Can these speakers pair to my trasmitter hooked up to my reciever? Is this speaker weather/rain proof that can be left outside. I'd like to connect this to a receiver that omits bluetooth. Is this feasible with this device? Does this have speaker wire connections in case I don't want to use Bluetooth for a specific event but want to plug the speaker up to an amplifier? Hi Craig, Only the satellite speakers can connect like a wired speaker. The master speaker can only run via Bluetooth. what if I don't like it for any reason? What is your return policy? What about defective units, what is your return policy? Do you sell extended warranty like other retailers? Hi Dan, You have a 30-day trial period in which you can return the speakers for refund or exchange if they do not meet your need. These have a 1-year warranty. We do not have extended warranties. once you switch the power on can it be left on. What is the max number of speakers I can connect (wired) to the bluetooth speaker. I would like to do 4 to six speakers. Paul, The internal amps on these are not built for multiple speakers. They can only run as is. I suggest running an amp and wired speaker then running a Bluetooth receiver into the amp to allow for Bluetooth wireless. IF I BUY 2 SPEAKERS CAN I CONNECT TO BOTH SPEAKERS FROM ONE BLUE TOOTH SOURCE (IE: MY IPAD)? Is this for one speaker or two individual single speakers?